Weddings are an expensive business: venues, caterers and entertainers all tend to bump up the price as soon as they find out it’s someone’s big day, so it is no wonder couples have often looked to untraditional sources for low-cost alternatives. From Virginia, Tiny Chapel Weddings is one such option. 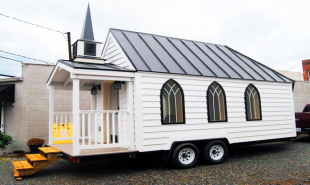 The Tiny Chapel is a mobile wedding venue for those who prefer affordable intimacy and romance to costly grandeur. The 100 square-foot Tiny Chapel was built and decorated by retired minister Bil Malbon, who now performs non-denominational weddings full time from his mobile wedding chapel. The venue is perfect for those with monetary or time constraints, or for less extravagant affairs such as vowel renewals. The chapel can host up to 25 people and includes a small area for the bride’s pre-ceremony preparations. 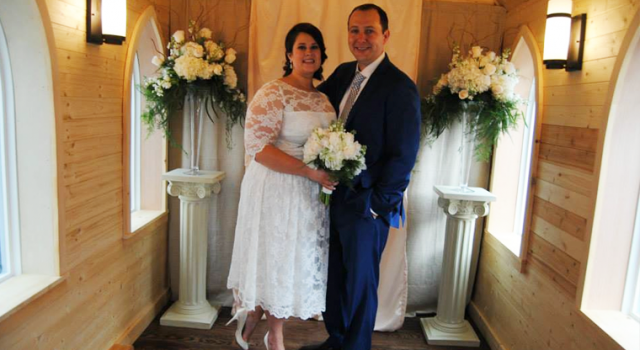 Soon-to-be newlyweds can hire the chapel for as little as USD 100, which buys them an off-peak wedding package including a 30 minute time slot for the ceremony and photos at the chapel’s permanent location in Richmond, Virginia. Alternatively they can splash out and pay USD 500 for a peak one hour time slot at a location of their choice within one hour of Richmond. The Tiny Chapel also offers a military discount to brides or grooms on active duty. Are there other traditionally large celebrations which could be scaled down in this way to cater for more intimate wants and needs?